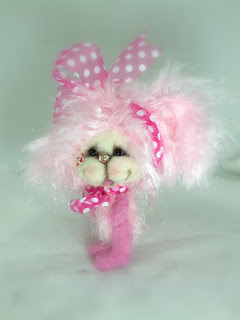 Marji has been chosen to be Thread Animals' 2008 FeaturedArtist of the Month for May. 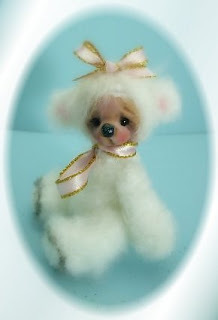 Please get to know her better by reading the interview below and looking at her lovely bears. Please leave a comment to let us know you were here. I grew up in Hawthorne and Vista, California. One place was in the city and the other in the country. Please tell us a little about you and your family. Married? Children? Pets? smiles at my bears. We have 6 children. No one is married but they are all growed up.We have 3 boys and 3 girls. Right now we have a 10 year old dog. The vet keeps saying that Abbyis old! We also have a cockatiel and a beta fish. The best petI ever had was a 4 foot iquana. She was a lot of fun. What other crafts hobbies do you like to do? like to embroider. I once worked for a TV show doing embroiderywork. It was a program about a family that traveled around the country in their trailer. The Grandma quilted and I did the embroidery on "her" quilt. Any crafts or hobbies you'd like to learn ? I am working very hard on learning more and more about lace making.It can be very adictive. I would like to learn how to tat and toknit. I really want to learn how to knit a pair of socks! her. She loved making the bears too. She made fabric mini's for many years and really is the one who got me started. She was a master quilter too. All I know, except forlacing, I learned from her. She had a magic about her and loved totalk to her creations. 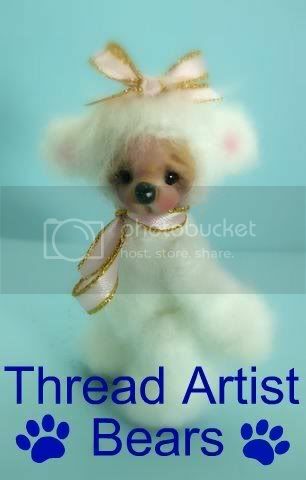 When did you start making Thread Animals and what was the occasion? 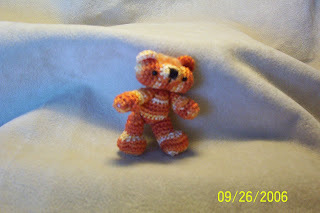 My mom and I were making doileys and came across a pattern for a miniature crochet bear and got hooked. I think that it might havebeen one of Berta's in a early magazine. 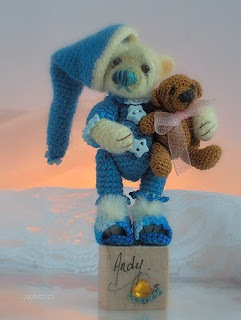 Do you recollect the first teddy that you made yourself? 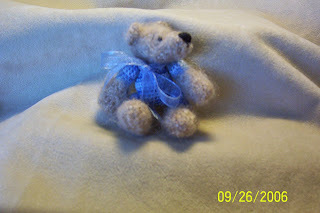 The first one I made was a doll size bear. My mom taught me how to sculpt the face. When she called me a "bear friend" I thought that I had truly made it. get ideas or inspiration for new bears? Honestly, I see a pattern I like and just try it out. 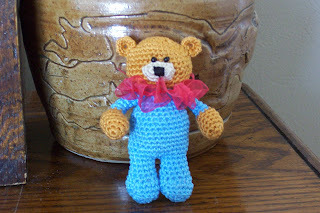 I have onlytried making one crochet bear on my own. That is the one in thepicture with the large brown bear. That bear was mine when I was6 months old. That was a fun challenge. 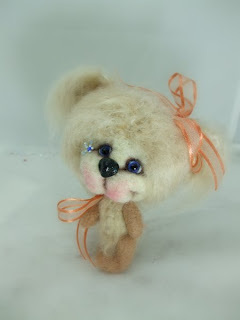 The felted bears are mydesign, except for the rug bear which was from a class with Bobbie. 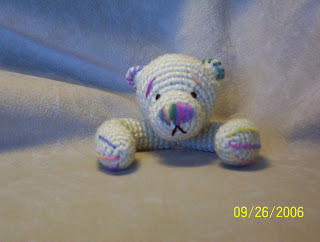 What do like most when making bears or Thread Animals? I really like the crochet part. When they are finished I am alwaysamazed that "I did that." You ladies have really supplied me witha fun time. 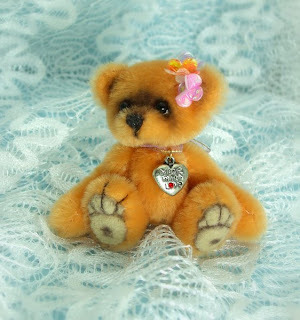 Do you have a personal great dream regarding the bear making? I have a new bear making friend and that is the fun of making bears...New friends. something about the place where you live. What's your place of birth? I was born in Hawthorne, California in 1953. My dad had his own business repairing TV's and Radios. Those were the days when you could fix things. Mom was always busy sewing us girls clothesor making dolls. Those were her doll days. So, I grew up watchingher create things and give them away! When I was a young teen wemoved to Vista, California. I really didn't start making anythinguntil I was in my early 20's and then it was clothes for babies.Vista was very rural at the time. Do you think that your hobbies/crafts are influenced by whereyou live/country or would they look the same if you lived elsewhere? that has helped me to feel comfortable anywhere. That is important as you feel "safer" to askquestions and learn new things. Tell us about what contests have you entered? Won? Awards?Publications? Can't say that I have done too many contest. I did win two blueribbons last summer at the Utah State Fair for my lace. How did you get started crocheting, who taught you? at first was babyblankets. Then, one summer, while I was awaiting child no. 3, she taught me how to read patterns. We practised with doilies. 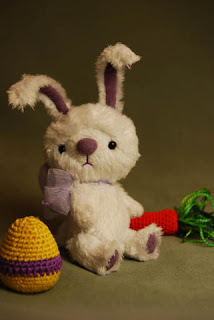 What was your first crochet or knitted project ? I believe it was a little purse. It was a church girl's project.I don't remember being very happy with doing it, but it was a start.I was somewhat of a Tomboy so didn't like "girl" stuff.Who inspires you? Have any tips for beginner Artists ? something else later but to start, just have fun.Also, there is nothing wrong with doing some one elses patterns.We can't all be designers but we can all have a good time. Bearsjust love coming to life. Even the grouchy ones! Where do you see yourself in 5 yrs... I hope to be making the bears still. Maybe I will try designing some day. I really hope to have some grand babies to share theselittle guys with. Do you have a funny or inspiring story about your Thread Animalsyou'd like to share ? What skill level would you say that someone needed to embark on their first bear project? 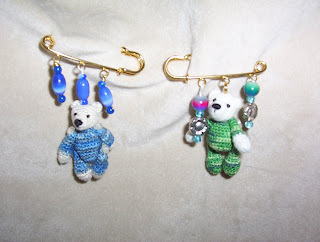 If you can single crochet and aren't afraid of steel hooks you cando just fine. Start with bigger thread and hook if that helps you get your tension down. 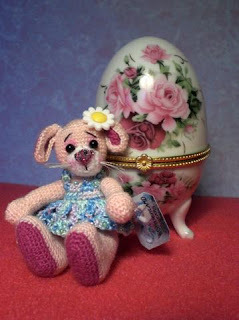 Which other crocheters work do you admire - either miniature bear makers or makers of other items? I love looking at Berta's, Debby Mc Carthys, Marylou,and Bobbie's work.They are so amazing. I have been previged to attend in person oneof Berta's classes in California and she was so gracious a teacher. 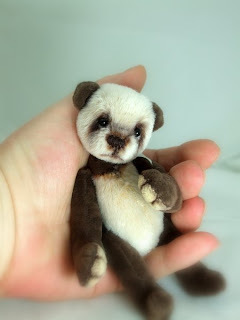 Do you have a favorite bear or animal that you have made so far? 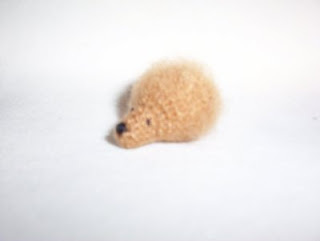 I have made hedgehogs and I love that. Only from the felting. Thelittle one that is crochet is a head "gone wrong!" Please describe your Thread Animal style with your own words. I love to use color so I guess that would be my style. I love looking at others creations and thinking, "I want one of those" and thank goodness there are artist out there that will share. Every month we send our Artist a list of questions to help us get to know our artists better. Here is Chantal's interview. Big question, I was born in Kolwezi (Congo), yes, you read very well ; Congo was a Belgian Colony in that time ; I spent 17 years of my life there and I left to finish my university studies in Belgium. I'm married to a wonderful man, Alain and we have 2 daughters, Johannie and Laura, and... grandparents of Darren and Lola. Laura, Darren, Alain and me are living in Canada, Saint John, NB. Johannie and Lola are in Belgium. What other crafts do you do? Any crafts you like to learn to do? Have you had any formal arts & crafts training? 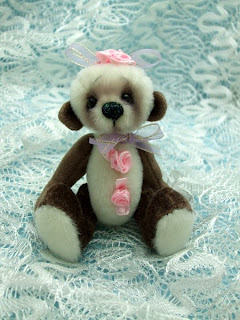 ex : tatting, bobbinlace, felting, knitting even painting are hobbies, I like to add to my bears. Tell us about what contests have you entered? Won? Awards? Publications? 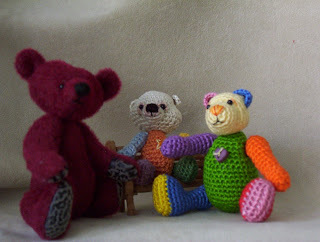 It has been a real challenge : as you can see all my bears are totally different ; I create them following the thread or the yarn I'm using. It's really difficult for me to follow a pattern. That's why I participated once again in Berta 2007 Round Robin.. I had to follow a pattern and change it for another artist. 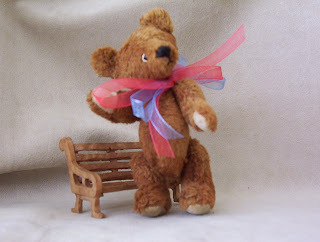 2007 : Second Place in Mini Bears, undressed Category, with Valerie Rogers and her URSA contest. Publications : Teddy Bears Review, Teddy Bear Scene, and Front cover of Bears and Buds Ezine. How did you get started crocheting? When I was a child, during our vacations, my Mom did not like to see us doing nothing ; so she teached us a lot of things, knitting, crocheting,sewing, hairpinlace are among the few things she showed us. How did you get started making ThreadAnimals ? 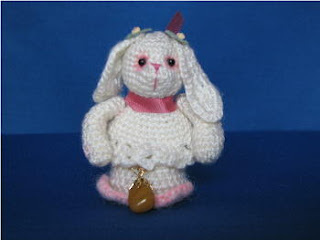 When I was pregnant, I crocheted toys for my daughters. 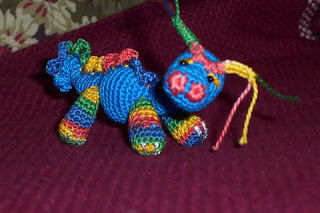 I think that Lola my granddaughter is still playing with one I made. I don't know really, but I think I had a boost of creation with the birth of my grandchildren. Do you think that your bears are influenced by your place of residence/country or would they look the same if you lived elsewhere? I'm not sure that a place can change the style of the bear, but for sure, the moods can alter the style. Imagine the disaster for someone who is making miniatures. I decided to continue the teddies without saying anything to anyone, only closed friends and family knew my drama and believe me, they have been very helpful. So my tip for bears makers, beginners and the others : don't let life steal your passion. If you are not feeling good, continue to create your little dreams. Believe me, they have been a big part of my therapy. 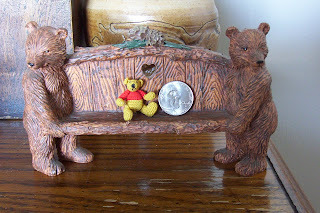 No medications, nothing could or can help me now recover the lost sight, but my bears, yes they are a great help. Everyone can embark on their first bear project. 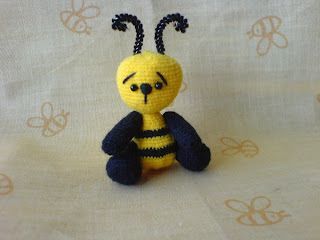 We are not alone ; our ThreadAnimals list is full of Artists, very helpful..
look .. I was not very happy with the legs and arms jointing ; I read the files and I found the solution for my bears ; that's the proof that even it's been a lot of years you are making bears, you are still learning every day. I don't have any preference... for me, an artist is an artist. And I will respect everyone because they are working hard to create their little ones. Forgive me Berta, but it's true, you gave me the bears shot.. Note: Chantal did the lovely photo collages of her favorite creations, family, and first bears. 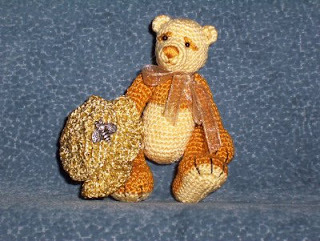 She also has some absolutey fabulous bears pictured at her website, which I hope you will take time to visit. Thanks Chantal for Sharing your talents. 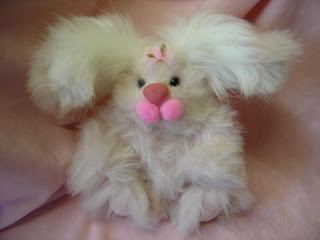 Another darling "Flopsy", 8 inches tall by Karen.